As an artist, I am, on a very regular basis, asked to donate artwork. Everyone, but the artist, thinks this is a great idea. In the beginning, I donated to every organization that asked. I thought it would give me good exposure—free advertising. But that is the WRONG reason to donate. In reality, most of the time, donating art work just left me feeling used. Someone would acquire my work at a dirt cheap rate. 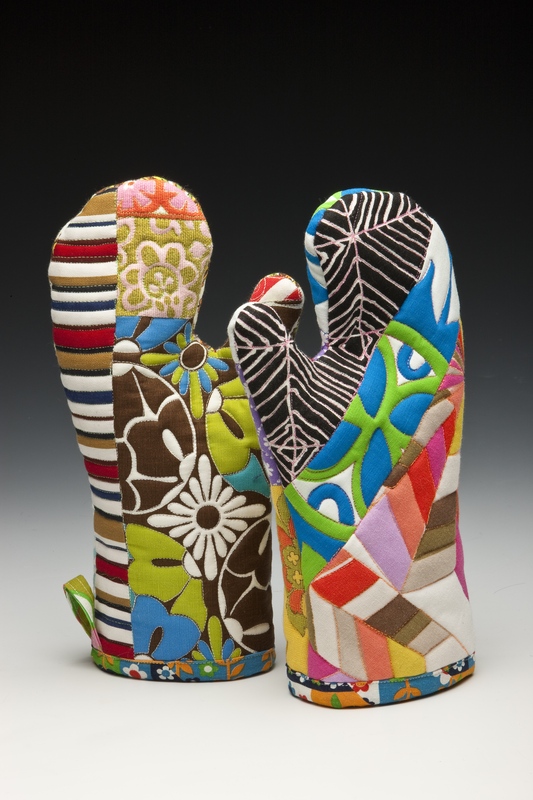 Once, I donated a pair of Artful Oven Mitts to an auction. I attend the event only to find out that they didn’t even auction them. They sold the pair for 15 dollars! It hurts when you find out that something you lovingly crafted went for pennies on the dollar. Once, a pair of my oven mitts went for almost 300 dollars in a live auction. Now, that is a crowd that likes my work. Which organization do you think I am still donating too? The Wrangell Mountains Center regular receives hand crafted items from me. I feel good knowing that my work is supported, and I am raising money for the organization. 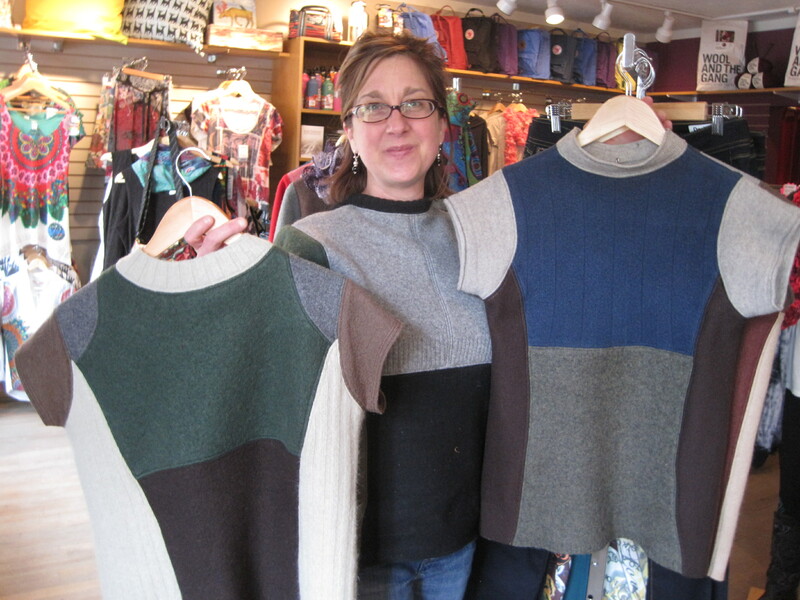 Lately, the WMC has been getting the last of my ArctiCouture sweaters. Remember when I was going to be a sweater designer? What was I thinking? It is for the above reasons that I donate my artwork only to organizations where I know bidders value and appreciate my work. In addition, I like to have a personal relationship with the organization—love should flow both ways. That is what makes donating art to an organization feel right. This past week, I packed up two little quilts for auction. The first is ZIG. This small piece was part of my solo show Hot Crossed Squares at the Gary L. Freeburg Gallery in Soldotna, Alaska. It is 9 inches by 9 inches and will be raffled off as part of Quilts for Art: Small Quilts Raffle. 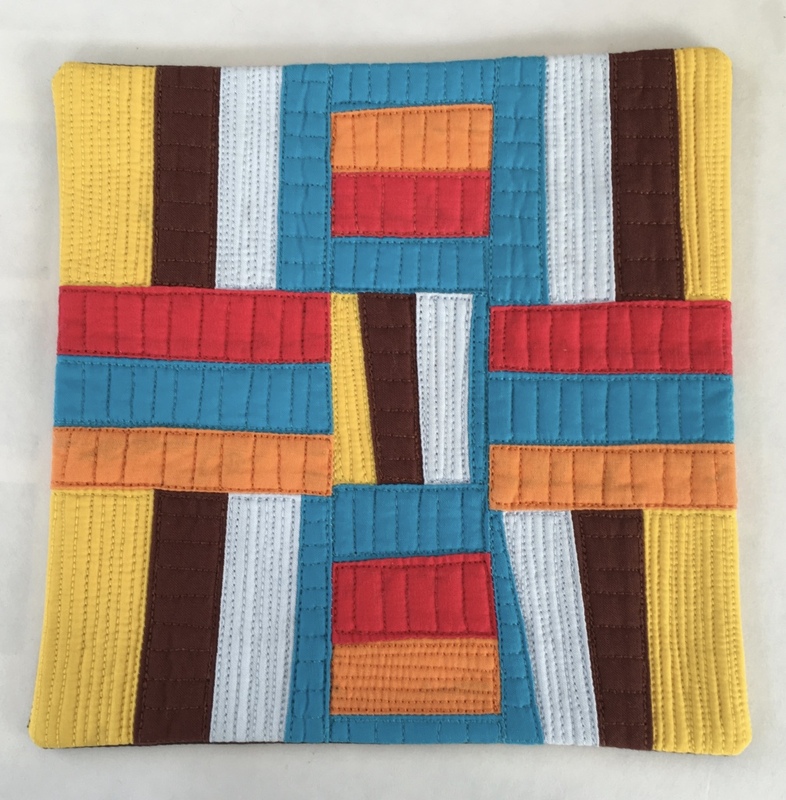 The funds raised will be used to support the Schweinfurth Art Center’s ongoing exhibitions and programs including Quilts=Art=Quilts. I have exhibited in QAQ. In fact, TRIBE will be part of this year’s exhibition. Additionally next summer, I will be teaching at Quilting By the Lake which is a Schweinfurth Art Center program. You can see the complete rooster of amazing teachers by clicking here. I will be teaching during Session #1 Abstraction through Color, Pattern, and Repetition (Monday and Tuesday July 17 & 18) and Making Prints Out of Solids (Wednesday Through Friday July 19, 20, & 21). I also donated a small quilt to 2016 International Quilt Association Silent Auction. The quilt is called Hopscotch and measures 13 inches by 13 inches. 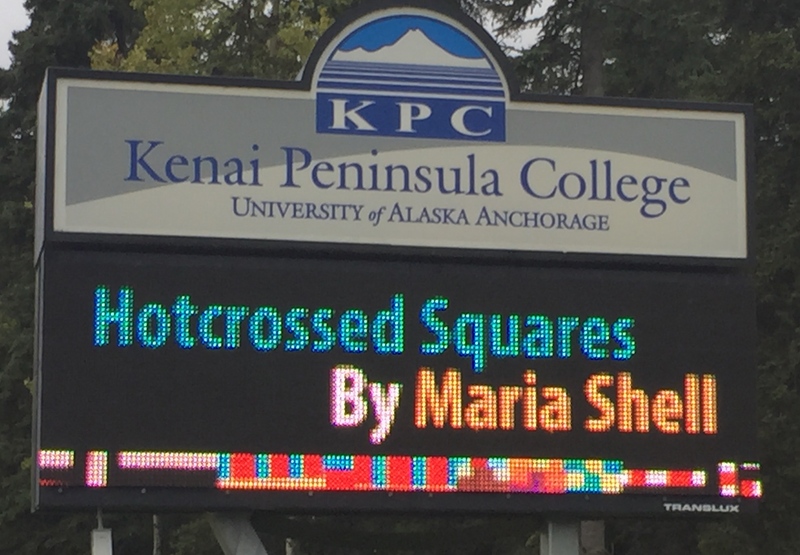 It was also part of the Hot Crossed Squares show which will forever in my mind be known as the show where I got my name in lights. 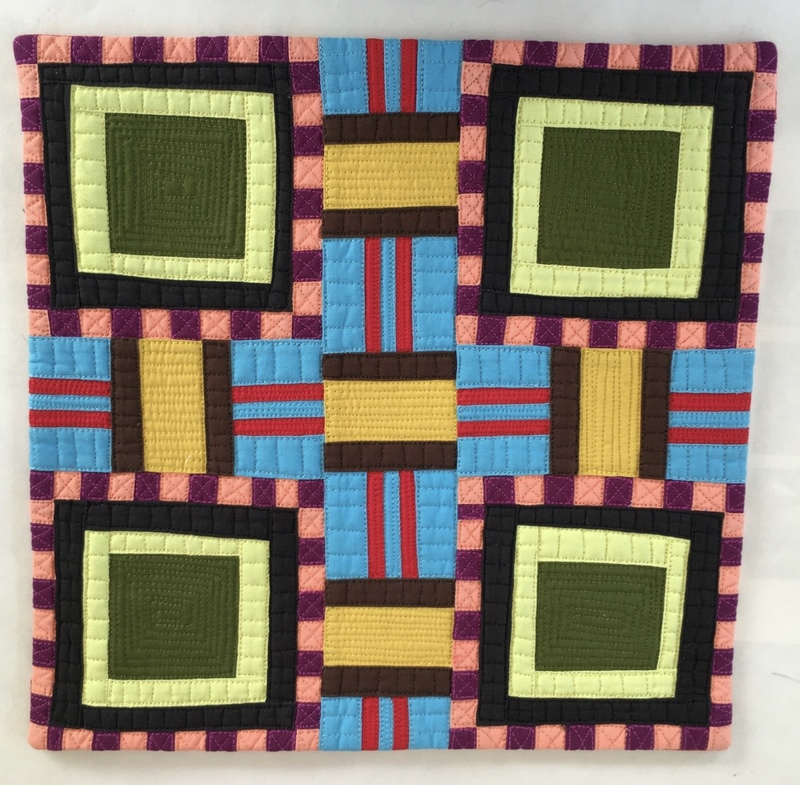 This IQA auction is a fun live event held during the International Quilt Festival. My favorite art quilt auction event is the SAQA Benefit Auction. 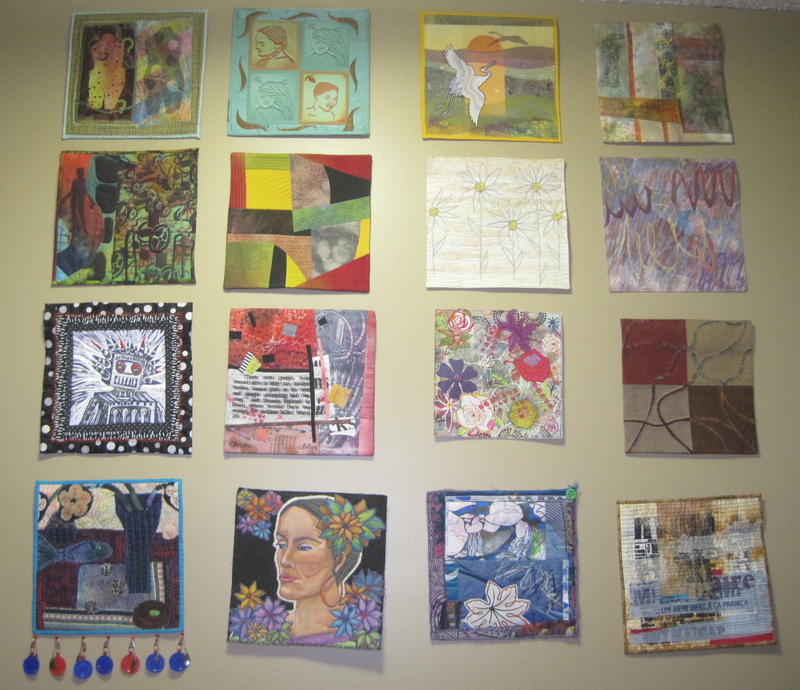 Members are encouraged to donate small 12 inch by 12 inch art quilts. 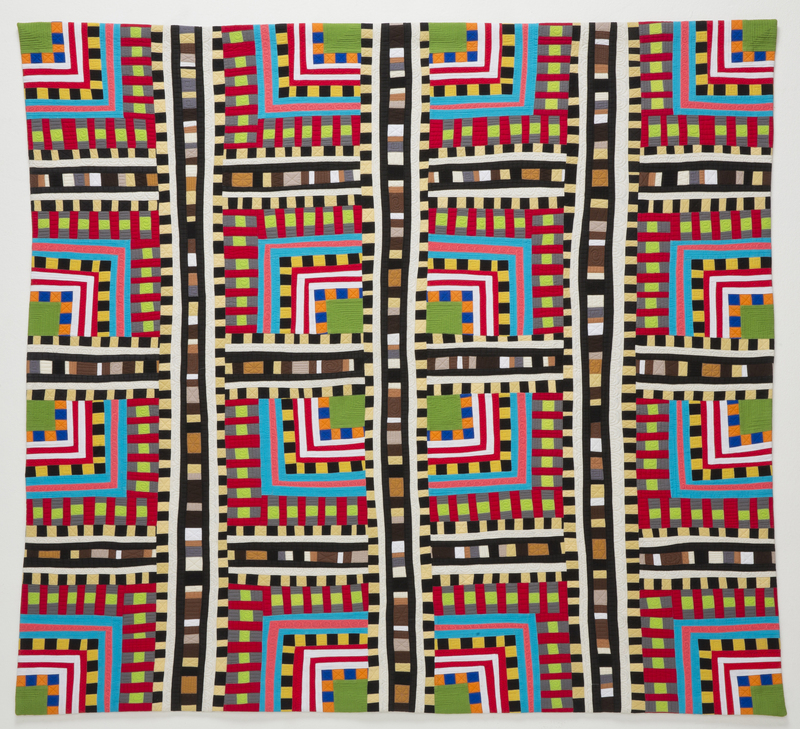 For three glorious weeks, these quilts are part of a reverse auction. The event started yesterday with Diamond Day bidding – an early bird opportunity to purchase ANY quilt for $1,000. After that, for the next three Mondays, a different selection of quilts will be available for bidding, starting at $750. Every couple of days, the price is lowered. You decide—bid now and get the quilt or wait until the price is lowered and maybe not get the quilt. It is a difficult decision. This year, 437 artists donated work. I am a collector—I have 24 pieces in my collection. I love to visit the auction and follow the links to each artist’s website. I particularly like discovering a new artist. But I am also a fan of collecting famous artist’s work too. You can read about my collection here and here. This year I donated Habanero Mini to the SAQA Benefit Auction. Yesterday, I got an email from Martha Sielman, the Executive Director of SAQA, letting me know that Habanero had sold for $1,000 as part of the Diamond Day Bidding! WOW. Talk about a whole lot of good feelings for a variety of reasons—I just helped raise money for SAQA and a collector likes my work enough to pay good money for it. After years of donating art and feeling ambivalent about it, I think I have figured it out. Donate in a meaningful way, and we all get to feel good. Don’t forget. 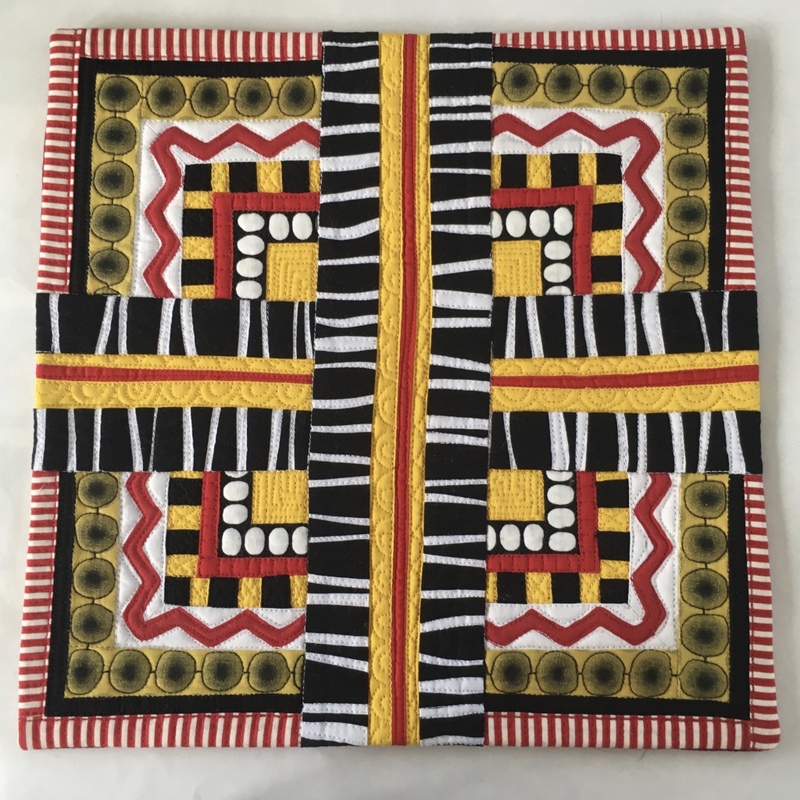 Regular bidding on the SAQA auction quilts starts Monday 2PM Eastern time. You do not have to be a SAQA member to bid. If you want the details on being a bidding pro click here. 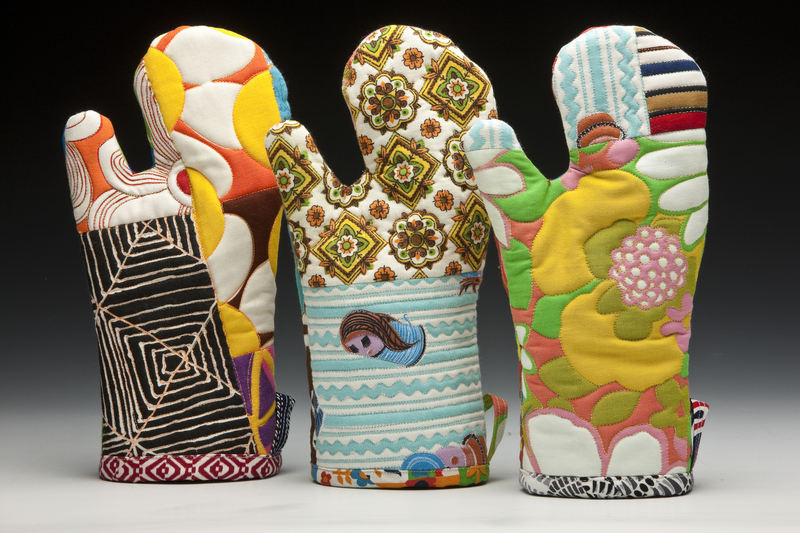 PS If you like those artful oven mitts, you can learn how to make them at the International Quilt Festival in Houston, Texas this year. The class is scheduled for Thursday, November 3, 2016 9AM-NOON. The course number is #453 and the name of the class is Artful Oven Mitts. I even supply the cool vintage fabric to make the mitts! 17 Sep	This entry was published on September 17, 2016 at 1:40 PM. 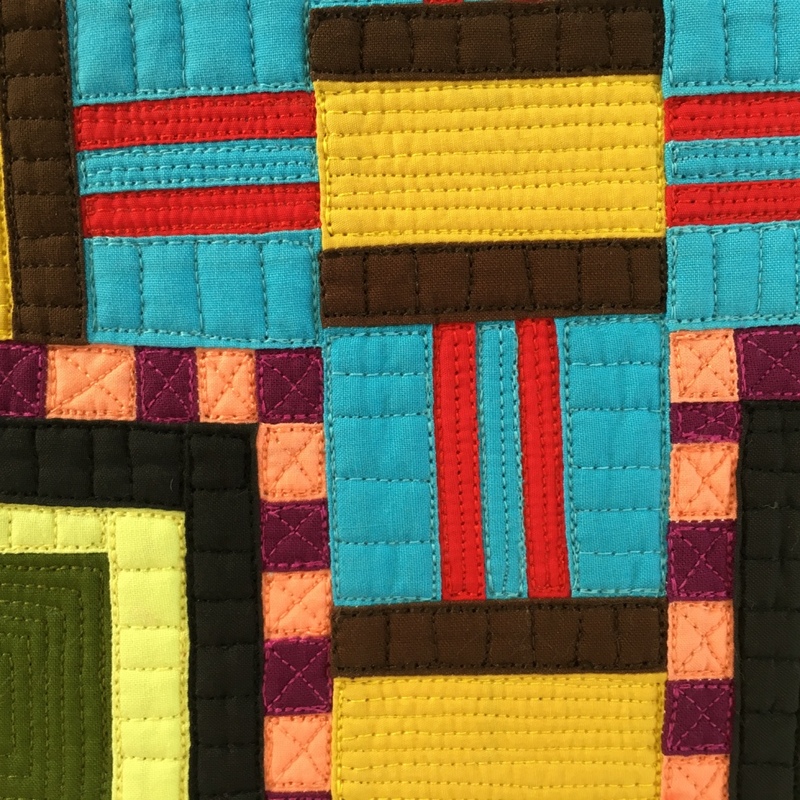 It’s filed under News And Events, Quilt Stories and tagged Artful Oven Mitts, Donating Art, Habanero, IQA Houston, Quilting by the Lake, Quilts=Art=Quilts, SAQA Benefit Auction, Schweinfurth Art Center. Bookmark the permalink. Follow any comments here with the RSS feed for this post. Yes, yes, yes to all you said. I love looking at your work. The more I look, the more I see. I can understand your ideas about donating to auctions. I donated a quilt a few years back, only to find that they sold it for less than the materials cost. And then they forgot to give me a donation receipt! Thank you profmom. I know what you mean. I have learned my lesson and any organization I donate to, I truly believe in. Thank you for stopping by! Mazeltov, Maria. I love all of your work, but this little 12 x 12 is simply scrumptious. Bravo, once more. Your fan, Sue (who’s yearning to get back to work in her studio)…. Sue get back in your studio! I love my little piece from the SAQA Spotlight Auction. It is fabulous! Maria first I want to say I absolutely adore your work. It is inspiring every time I see what you have created. Habanero speaks directly to me and I know whomever bought it will enjoy it much more than I am just looking at it on the PC screen. About donating one’s art, I also had a less than fulfilling experience with this. I agree that we need to find the right venue to donate our art, where it is appreciated and we can experience that. Lastly, those oven mitts are baaaddd…. ahh inspiring! I am not one who usually prefers oven mitts over potholders (and I have made plenty potholders) but yours are truly inspiring. Enough so for me to consider taking a more creative look at making them. I wish I could sit in your class but perhaps another time. Keep being creative and inspiring with your art. Dear Mary D- I would send you an Artful Oven Mitt pattern. Just email me via my contact page. Thank you for the kind words about my quilts! You are right. People who ask for your “donations” to sell or auction usually do not have a clue with the work involved in the creation, no matter what size the piece is. In most of my work (beads, quilting, knitwear design, or needlepoint on silk gauze at 1024 stitches per square inch) I may generally use up to 250 colors in the piece. Even if there are only a few beads or stitches of a particular color, I have to have that color in my pallette. Beads and stitches are one at a time. Not to mention the hours and hours (including those in the middle of sleepless nights) of working out the design and structure and method to get what you want. However, I was very pleased to donate one of my favorite neckpieces to Maine Fiberarts. They had hosted a solo exhibition for me in 2009 and do wonders for fiber in Maine. I gave them my “180 Triangles” (no two alike) with which they raised $750.00. We are, right now, moving from Florida back to my home, Maine, after too many years. I vey much look forward to spending lots of time at Maine Fiberarts. Your blog is a delight. I am jealous that you get to live in Alaska, which I love to pieces. But now I will have Maine again, so all is well. Our stories are so alike on this matter. I couldn’t agree more. Maine Fiberarts sounds fabulous. thank you for putting them on my radar! Congratulations on being one of nine silver sales! It’s a beautiful piece. Mary, I have had that feeling too–wanting to know the final auction bid on my work. If the organization or event is one that I truly do support, then I don’t care. But if it is an organization I am considering being a long time support of, I do want to the final price. I hope you are doing good and getting lots of stitching done! A great subject to explore, and I have had that same experience–donating a quilt and having it sell for pennies. Mostly I’ve decided that I’d rather give that nominal amount to the charity, and keep the quilt myself! CONGRATULATIONS on the diamond sale! And as always, I LOVE seeing your work, especially these small pieces and the closeups so I can see your quilting. I have actually bought my own work before at an auction when it was not going for a fair price so I totally get what you mean. You new series is amazing! I am really enjoying your blog. Keep sharing! I just enjoy everything you do, such patience. Loved taking your class in Delray Beach hope you will come back now that you are even more famous. You can stay with me! Penny, that would be great fun. Maybe when my book comes out I will do a Florida tour in the winter! I so agree with the donation thing. I had the experience of donating a quilt to a live auction for a good cause (augmenting a cancer patient’s medical bills) …not only did they spell my name wrong (a personal bugaboo of mine) They did not hold a ticket for me to the sold out event. I arrived at the event w/flowers, and a card, and ended up never getting in. I’m done with all of that. Have fun at QBL, they are a very enthusiastic crowd. Once you have had an experience like that Lorie, it really makes you think about how and what you give. I am so excited about QBL, I wish you were going to be there!